Xiaomi Diagram Tool v1.0 is a small application for windows computer which allows you to quickly access the board diagram of your Xiaomi Smartphones and Tablets with its simple and easy to use interface. Xiaomi Diagram Tool v1.0 allows you to access the diagram of the internal physical structure of your Xiaomi Smartphones and Tablets. The diagram comes in pdf file format. You can easily view the detailed board diagrams using any pdf reader. 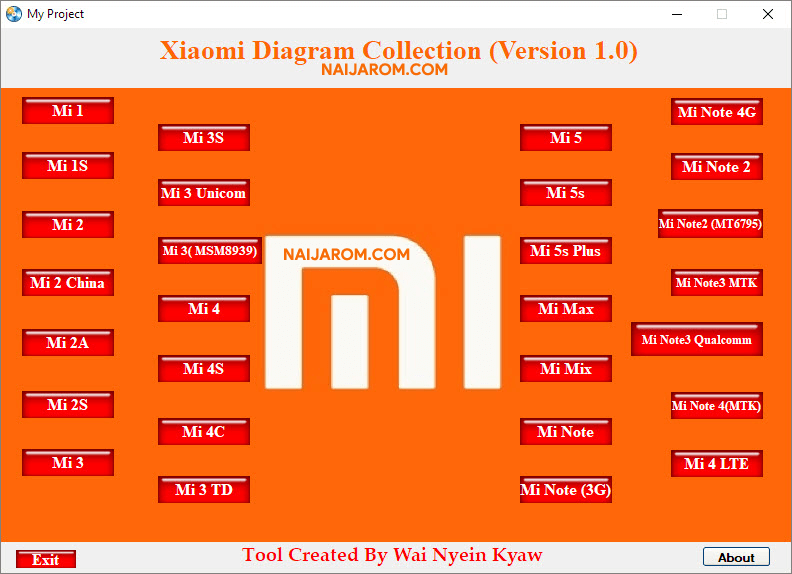 Xiaomi Diagram Tool v1.0 supports various Xiaomi devices such as Mi 1, Mi 1s, Mi 2, Mi 2 China, Mi 2a, Mi 2s, Mi 3, Mi 3s, Mi 3 Unicom, Mi 3(MSM8939), Mi 4, Mi 4s, Mi 4c, Mi 3 TD, Mi 5, Mi 5s, Mi 5 Plus, Mi MAx, Mi Mix, Mi Note, Mi Note(3G), Mi Note 4G, Mi Note 2, Mi Note 2(MT6795), Mi Note 3 MTK, Mi Note 3 Qualcomm, Mi Note 4 MTK and Mi 4 Lte. In order to use the Xiaomi Diagram Tool properly, you need to install the Universal ADB Driver on your Computer. Once Driver is installed you can successfully connect your Android Device to the computer, and launch the Tool on the computer. [*] Credits: Xiaomi Diagram Tool is created and distributed by Wai Nyein Kyaw (developer). So, full credits goes to Wai Nyein Kyaw (developer) for sharing the tool for free.